The Official Add-on Installation Guide "Answers to all your expansion pack-related questions!" Ask any questions you have in this thread. It's fairly awesome. But frankly, I think all those add-ons should be free now and should be made available as grp files. Well, it would be good to have it stickyed so that it should (although it probably wont) stop the 100's of threads being made on how to run them. But in Xtreme i can never get the new art to show (cobra and ape enemies) in eduke. I have Duke!ZONE 2 and Xtreme, so I will work on the guide for those soon. I'm in communication over a freeware release of NW, Deadly Kiss for SW, and possibly Duke!ZONE/2. Ohh that sounds interesting Keep looking into it! I don't have the VACA13.SSI, VACAPP.SSI, or VACA15.SSI files in the RAR I got. I have the stuff installed, however all the add-ons are now just sitting amongst each other in the eduke directory, which makes it very cluttered. EDuke has this nifty option to look for alternate content in a folder for alternate content. DukePlus for example has its stuff in its own subdirectory. Couldn't the addons in their entirety similarly be placed in a subdirectory? And if so; can the installer be updated to do this? Heh, it isn't that easy. First, the bat file is giant amount of text. Second, the grp and hrp files have to remain in the main directory, because the bat file will look for them there. Third, this is after the fact. It requires you to navigate to the directory and then manually figure out which files belong with this addon especially if you have multiple addons installed. Much easier if the installer simply used the directory from the start. I'll make that change next time around. anything. This program from ProAsm is a good one to make grp files. Could this be moved to the "Random questions, bug reports, "help me" threads and other unexciting things" forum? I still see a lot of newbies posting the same questions and making the same mistakes. Setting up a VM on 7 x64? That's just ridiculous and totally unnecessary. Major update to the OP. Added Duke Assault to list, with tutorial. Added Duke Xtreme and Duke!ZONE 2 tutorials. 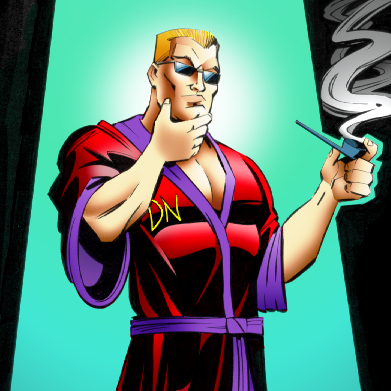 New version of Duke D.C. installer. Minor changes to Caribbean section. Added complete listing of CDs for each add-on. Note that I made some changes from Lunick's recommendations to follow these guidelines, namely playing nice with other mods. I have looked around the forums to try and figure out how to get Duke Caribbean working in eDuke32. None of the instructions seem applicable to what I have. My Killaton CD doesn't have VACATION.GRP or VACA13.SSI, VACAPP.SSI, or VACA15.SSI. I have attached the list of files that I do have and would be greatly appreciative of anyone who can help. Mod Edit: Follow the OP, not these spoilered instructions. Rename "VACATION.PRG" to "VACATION.GRP" then rename all the *.NOC files as follows - GAME.NOC to VGAME.CON - USER.NOC to VUSER.CON - DEFS.NOC to VDEFS.CON. now copy these files to your Duke directory. Go to the file menu ans save as, make sure "All Files" is selected and save it in your duke directory as "VACATION.BAT"
Run that file and you should be playing it. Then upload kt_vaca.txt. That will allow me to add support to my setup. Anyway I will try the instructions and post the results. Follow my instructions above, not Treason's. The VACATION.PRG file is the same as VACATION.GRP, and I have updated the instructions to reflect that. Thanks. I followed those instructions and it works like a charm! But now it has complicated things a bit. I have been messing around with the Duke 3D, duke plus and the HRP pack. I never would have thought, but after messing around for a while I actually missed the plain old pixelated graphics of the original game. With eDuke32 and Duke Nukem 3D it seems fairly easy to enable/disable the HRP and duke plus. My question is, is there a way to have Duke 3D, Caribbean, Nuclear Winter and Duke it out in DC configured in eDuke32 so you can enable and disable the HRP's? If you want the 1996 renderer, set your video settings to 8-bit classic. If you want to keep the 32-bit mode's features, go into video advanced settings and turn off models and textures. Ooh. So change the setting in the game's menu! I didn't think to try that! Thank you again for all your help! I'm so excited that it all works!!! It's like 1996 all over again!!! If you, are the copyright holder, or an employee of the copyright holder, and you do not want any of the titles available here to be distributed, then please contact us and we will remove the link immediately. I really don't think there will be a problem, that site is #7 on google search for "duke it out in dc" so you don't need to go to great lengths to track it down either, as far as i know the only way to make money on it is to sell it second hand on amazon. Insert your Duke Xtreme CD, Kill-a-Ton Collection Disc 3, or Duke: The Apocalypse CD into your CD-ROM drive. Copy the DKXTRM directory from the CD to your EDuke32 directory. In DKXTRM/PACK14, rename DKEXGAME.CON to GAME.CON, DKEXDEFS.CON to DN3DDEFS.CON, and DKEXUSER.CON to DN3DUSER.CON. Run EDuke32 with these command line parameters: "-j DKXTRM\PACK14 -j DKXTRM\SPMAPS -j DKXTRM\DMMAPS".